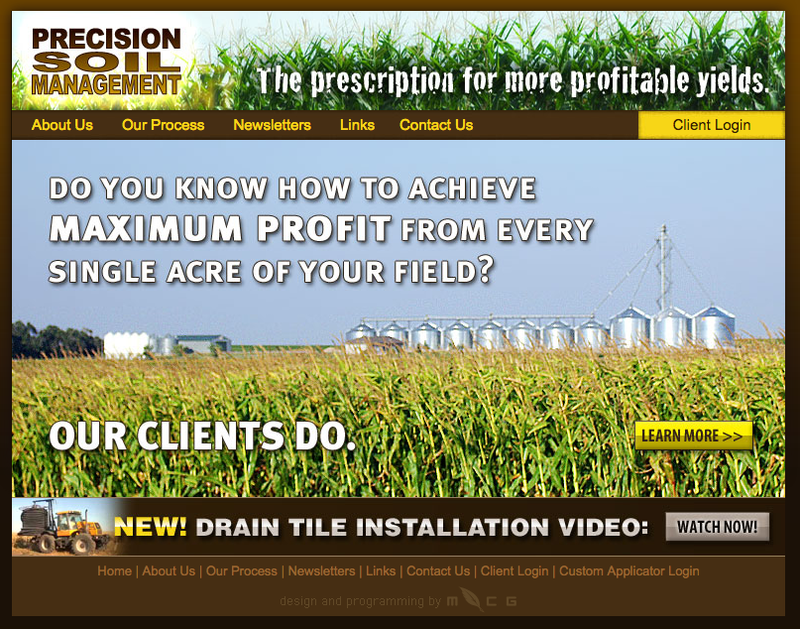 Complicated Soil Management Site | McQuillen Creative Group, Inc. The cool thing about what we do at McQuillen Creative Group is getting to learn about a lot of different industries and practices within those industries. As we learn more and more about our surrounding agricultural culture we’re fascinated by what people are doing. Take Precision Soil Management in Redfield, SD for example. These folks take a variety of soil samples from farmers’ fields, analyze them, then prescribe a mix of strategies to increase the yield of individual planting plots. We created a website for PSM that allows them to communicate with their clientele and store all their prescriptions online. But it’s a lot more complicated than that. A client has access to a lot of data on the website relating to specific acreages. And there’s a lot acreages being managed by Precision Soil. It helps that our web programmer, Zamani Peters was a computer programmer long before he started building websites. He knows how design complex database driven websites which are more dynamic, up-datable on the fly and incredibly useful for companies trying to grow businesses; and crops. PSM’s website was designed to be a repository for client information and not a “find us and hire us,” type of website. In other words, it’s not filled up with a lot of marketing jargon at this point. But given their success in a short period of time, I suspect their website will mature with their growth strategies. We’ve also made videos for PSM to help demonstrate and tell their story quickly for trade-show booths, presentations and online uses.